It is elevating to the spirit to encounter music and philosophy characterized by such warmth and amenity. Not Two is the fourth collaboration to includes a core ensemble of six performers led by Amir ElSaffar named Two Rivers. In their choice of instrumentation, Two Rivers pointed towards a blending of American and Arabic musical traditions: tenor and soprano tax, bass, trumpet, and drums, on the one hand, and santur (a hammered dulcimer of Persian origin), buzuq (a long-necked lute), and oud (a short-necked lute), on the other. 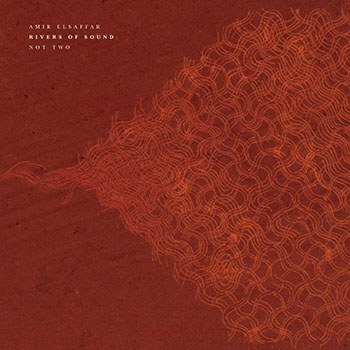 Not Two incorporates the musicians and the ethos established by Two Rivers into an expanded 17-piece Rivers of Sound orchestra, and Not Two their debut. ElSaffar has an affinity for arranging his music and ideas on vast and ambitious canvasses. As with the Two Rivers concept, the Iraqi maqam is employed as an organizing principle for the performances on Not Two. An Arabic maqam will consist of a set of musical rules around which the musicians will improvise and establish a specific mood and melodic profile for the piece. It is a genre as well as a style of composition and improvisation. ElSaffar does the casual listener a favor by summarizing the maqam in a less technical and more epigrammatic way inside the booklet, a very smart move, underlining its long history and appeal in Arab and other Eastern cultures. Here he writes: "The highest ideal in maqam music is to reach a state of Tarab, or musical ecstasy, the melting away of borders, when listeners and performers share in a suspended moment of space and time, losing a sense of individual identity, reveling together in the sound." Because ElSaffar has in the past been willing to engage his music in fraught political and social encounters, it is worth pausing over several points here. The last release from the Two Rivers ensemble, Crisis (2015), evoked the hopes and disappointments of the various uprisings across the Arab world since 2009, the first ominous waves of displacements resulting from the Syrian Civil War in 2013, and the annihilating dismay and melancholy felt as the roof fell in on Iraqi society following the invasion in 2003. Not Two is less pointed in its targets and is overall less explicitly political. ElSaffar's essay does seem to include a mild sting in the tail for the cultural appropriation police, declaring that "it is not important to ascribe practices to a tribe, nation, or creed. I cast doubt on the notion of ownership or of inventions belonging to a group of people. The Universe is in constant flux, and we are agents, reacting to change, as phenomena manifest themselves around us". But the prevailing emphasis instead arises out of ElSaffar's humanism and his attempt to raise a quantum of solace for not only the peoples of Western Asia whose lives and cultures have been lost and profaned in recent history but also for capturing a common human experience and communicating it with a common musical language. The maqam, then, is a stylistic choice as well as a metaphor for that ambition. Maqam and Western jazz, their carriers, performers, and listeners have particular but also shared histories. They develop within specific contexts but necessarily become part of a shared creative inheritance, no property of one religion, one people, one culture, or two. That is the thematic crux Not Two. Given ElSaffar's conceptual vision and musical virtuosity and the versatility of his collaborators, he is unlikely to fail to meet the musical challenge of his stated ambitions, and Not Two exceeds expectations. It brings multiple musical traditions together by clearly stating them, giving them space, and allowing them to drift together and interact in creative ways. "Iftitah", for example, flows gently with strains of Arabic folk music and foregrounds a sequence near the beginning of mournful trumpet lines with a Western melodic flavor, and then near the end a sax solo that draws out the microtonality -- the "notes between the notes" – characteristic of so much Arabic music. ElSaffar credits the Norwegian saxophonist Ole Mathisen for mastering this approach on tenor sax, an instrument normally associated with Western musical idioms. Mathisen is also then free to unleash a solo at the end of the 16-minute "Shards of Memory" that feels like pure John Coltrane in his Sun Ship phase, radiating agitation and seeking answers. Craig Taborn's extended piano solo towards the end of "Ya Ibni, Ya Ibni" is similarly striking, the Western-sounding pitches and tones of the piano rearranged into a microtonal contour. The effect is stark, tense, and beautiful. This creative dynamic drifts in both directions throughout Not Two and the musicians flow in and out of Western and Eastern harmonies. The music moves at an unhurried pace, carrying the listener along what simply feels like a rolling swell or a gentle surge on its natural course, bringing new ideas and opportunities for musicians and listeners to the surface. It is elevating to the spirit to encounter music and philosophy characterized by such warmth and amenity.